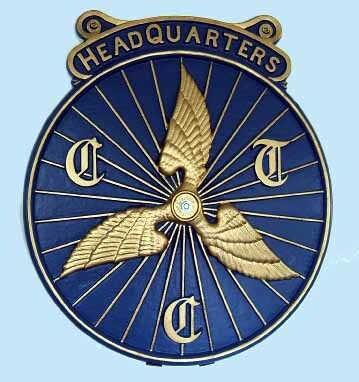 Portsmouth CTC has an archive of most of the committee and AGM minutes books from 1926 onwards as well as bound annual volumes of the CTC Gazette from 1891 to 1956, newsletters and various other papers. The following brief history of the club draws on these archives and on memory. We would like to expand this history. Please let Keith know of any corrections and additions to these notes. In the early 1920s if you rode with the CTC in this area you would probably have ridden with the South Hants DA (Portsmouth section). They rode from Portchester cross-roads or from the Fountain, Cosham. Then in February 1924, RD Maddock, the Councillor of Division XI, gave notice of an applica­tion that the South Hants DA should be replaced by the Wessex DA, covering parts of Dorset, Wiltshire, Hampshire and Sussex. And the next issue had a notice that the inaugural meeting would be held on Saturday 8th May. 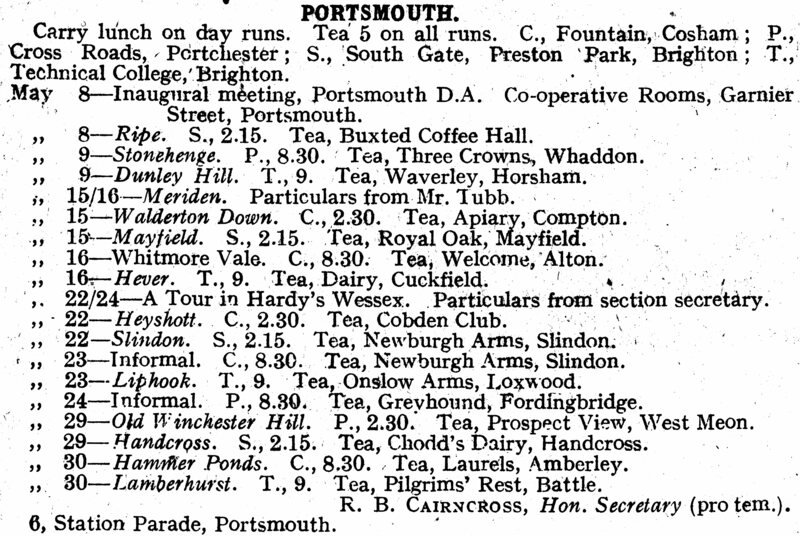 It seems the result of the inaugural meeting was seen as a foregone conclusion because in the same issue of the Gazette was the first Portsmouth runs list. On Sunday 9th May 1926, the first day after the inaugural meeting, the DA ride was from Portchester to Stonehenge (and presumably back). The inaugural meeting was obviously successful in agreeing to form the DA and in appointing a committee. In the DA archives we have early minutes of committee meetings and they show that the first committee meeting was held at 9.10pm, after the inaugural meeting had finished. The meeting lasted 25 minutes, a good example to today’s committee members. In the June Gazette there was a brief report of the inaugural meeting. The officers elected were Major R Bullin, president; Dr J Ford Palser, vice-president; Mr AE Watts, hon sec; Mr AE Hewlett, hon treasurer. Scarlet and gold were adopted as the DA colours. Portsmouth DA was not a racing club. In 1928 22 members met at Kingston Crescent and formed the Hampshire Road Club as a racing offshoot. Portsmouth members still race with the HRC. In 1932 Portsmouth DA organised the national South of England Cyclists’ Rally based at Southsea Castle attended by several thousand cyclists. The club continued activities during the second world war and immediately after, although, as the motor car became more popular, falling numbers put the club in danger of foundering. A few stalwart members kept the club going. Activities included weekly Sunday rides starting from Cosham and organised by different sections such as Wayfarers, Easy Riders, General Section and even a Saturday Section. Members enjoyed reliability rides, youth hostel weekends, foreign tours, cycling gymkhanas. In the early ‘80s a group of cyclists, most of whom were members of the CTC, formed a campaigning group called the Havant and District Safe Cycling Campaign (and later known as the Havant Cycling Campaign). They organised public meetings and meetings with local councillors in an attempt to introduce better and safer facilities for cyclists. In particular they lobbied for the disused Hayling Billy railway line to be converted into a pedestrian and cycle path. In this they were successful and the original path, which petered out north of the site of North Hayling Halt, has now been extended into Havant (although the surface of the original path has deteriorated badly recently). As well as the campaigning activity the group organised monthly and fortnightly, then weekly, rides starting from Havant. They also held club nights during the winter. By 1990 these rides had been incorporated into the Portsmouth CTC programme and since then the Saturday and Wednesday Havant rides have grown in popularity and complement the traditional Sunday fast rides from Cosham. In 1997 the club organised the South of England rally at Fort Purbrook. Since soon after its start the club has produced a newsletter and runs list in various forms, mostly until the early 1990s as a two-sided or sometimes even as much as six-sided foolscap duplicated publication. As personal computers made the job of desk top publishing easier the editors became more ambitious and now the magazine is a 28 or 32 page professionally printed A5 booklet. Similarly the club came into the computer age with this website. 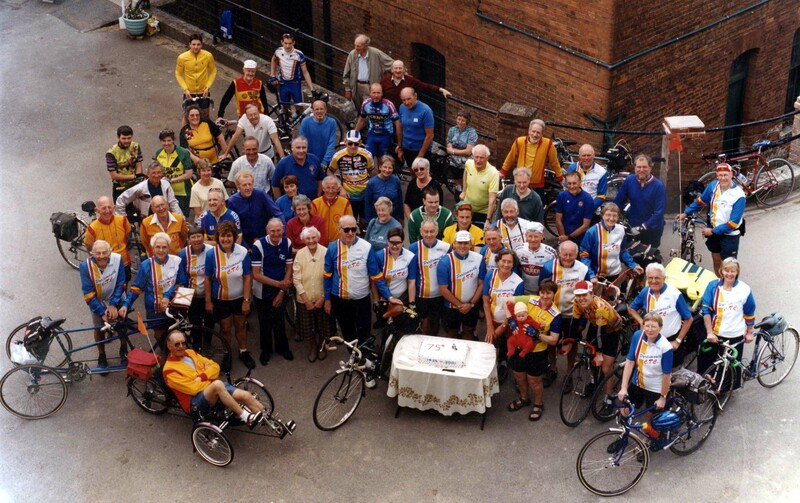 The Bicycle Touring Club was founded on 5th August 1878 at a meeting in Harrogate. By 1883 it had 10,627 members and the name was changed to the Cyclists’ Touring Club. Services to its members included the erection of road signs warning of steep (down)hills, which were dangerous for riders of penny-farthings and cycles with minimal brakes; negotiation of favourable rates for cyclists at hotels and hostelries with recommended establishments included in the members’ handbook; and later in 1910 the institution of an accident insurance scheme, followed in 1925 by third party insurance. 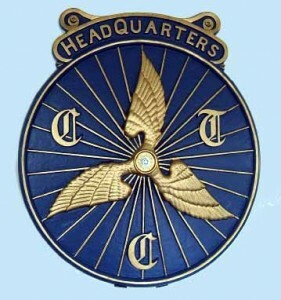 In 1886 the winged wheel was adopted as the club emblem and cast iron or enamel plaques were fixed to CTC-recommended establishments and cycle repairers. Many of these are still in existence today. In 1894 the first District Association (DA) was formed. The DA was a local group of members who lived within a particular area, usually a county, later a post code, and who organised local activities. The term DA is no longer used, instead there are ‘member groups’ (a term disliked by older, traditional members who also, incidentally, regret that the winged wheel has been replaced by a modern logo). By 1899 the club had reached the amazing number of 60,449 members. The club’s publication which started in 1878 as the Monthly Circular went through various name changes. It became for many years the CTC Gazette, then Cycletouring and now the bi-monthly Cycle. From 1898 the club operated a touring bureau, more or less a travel agency for cyclists, selling travel tickets and arranging the necessary customs documents for taking a bicycle abroad. It no longer does this. CTC tours in this country and overseas and led by experienced CTC members became popular. These are now operated by CTC Cycling Holidays and Tours Ltd.
After a dip, as cycling decreased and car ownership increased, the club is now again thriving with a membership of around 70,000. From its beginning the CTC was dedicated to fighting for cyclists’ rights; from suing the Hautboy Hotel in 1899 for refusing to serve Lady Harberton because she was wearing ‘rational’ cycling dress (they lost); to its current campaigns which can be seen here. In 2012 the club assumed charitable status and is now termed ‘CTC the national cycling charity’. In 2016 CTC rebranded itself as 'Cycling UK'. There's more information on the club's history on the Cycling UK web site here.